The lightweight Beechcraft 35 Bonanza civilian airplane, produced post-World War II, was expensive compared to other personal aircraft. Because of the steep price, mostly professionals, like doctors and lawyers, could afford them. The tail, an unusual V shape, was designed to reduce both the weight and drag of the aluminum plane, helping to make it faster than most of its competitors. But unfortunately, the tail design was also attributed to an initial high accident rate. That early Bonanza became known as the “Doctor Killer.” The Beechcraft 35 Bonanza background was just one of many fascinating stories we learned as we wandered the Mid-America Air Museum in Liberal, Kansas. 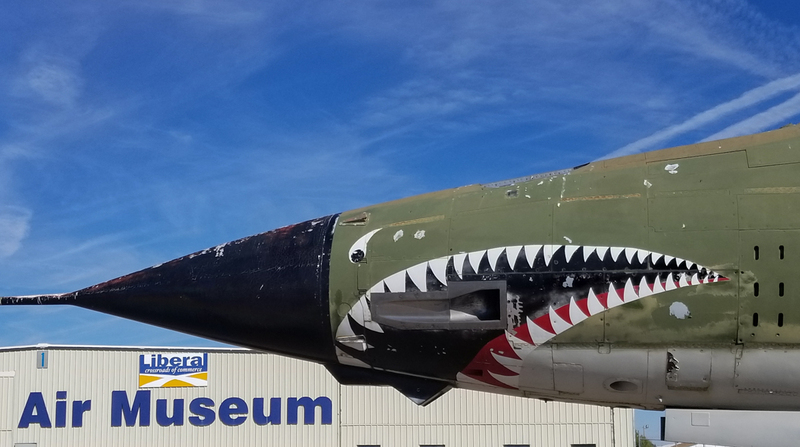 Located on the former Liberal Army Air Field, the museum displays over 100 planes, ranging from small home-built aircraft to large military jets. Thank you to the Liberal Convention and Visitors Bureau for hosting us in Liberal, Kansas. 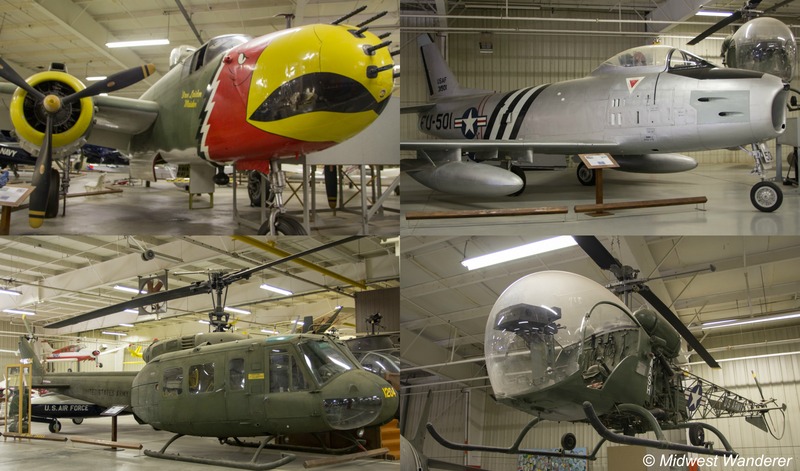 The museum property began as the Liberal Army Air Field, built in 1942, during World War II. The purpose of it was to train pilots on the B-24 Bomber, also known as the B-24 Liberator. The air field ran from 1942 to 1945. During that time they trained 5500 pilots. It closed down in 1945 when the B-24 became obsolete. Then in 1951 Beechcraft came in and set up shop to build aircraft, and that lasted until 1985 when the bottom fell out of the general aviation market. Now let’s jump over to Col. Thomas A. Thomas. Col. Thomas was a World War II flying ace. After the war he started collecting aircraft. He had a collection of about 72 aircraft. He formed a flying museum, taking planes to air shows all around the country. Fun Note: For his 65th birthday Col. Thomas flew 65 of his planes, all in one day. And he did it in about eight hours. 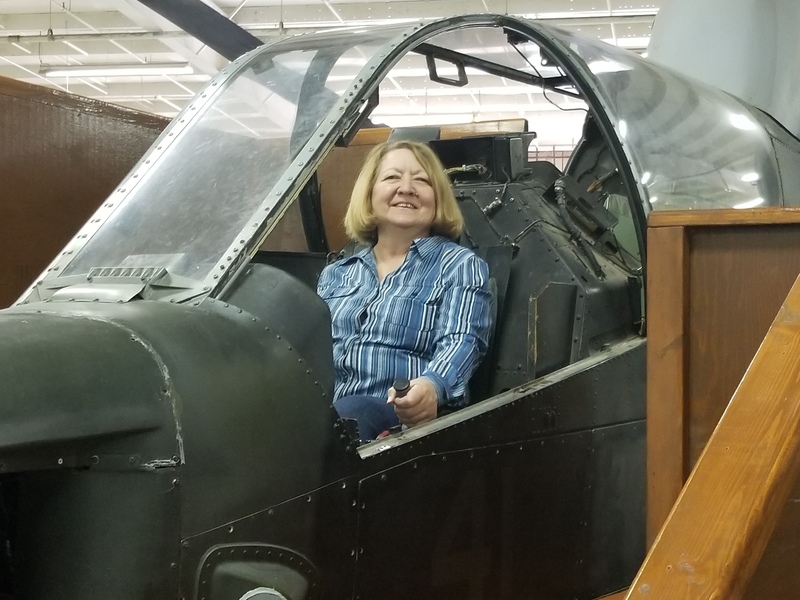 In 1986, during the 40th anniversary reunion of the Liberal Army Airfield veterans, some of the guys came up with the idea of starting an air museum. By now the City of Liberal owned the empty buildings, which could be used for the museum. But they had no aircraft. And until now, Col. Thomas’ aircraft collection was sitting out in open fields. So the guys approached Col. Thomas about starting a museum on the air field, and he agreed to loan the museum a good portion of his collection, which he later donated to the museum. He kept a few of his favorites, including the kind he flew in the Air Force, P-40s and P51s. 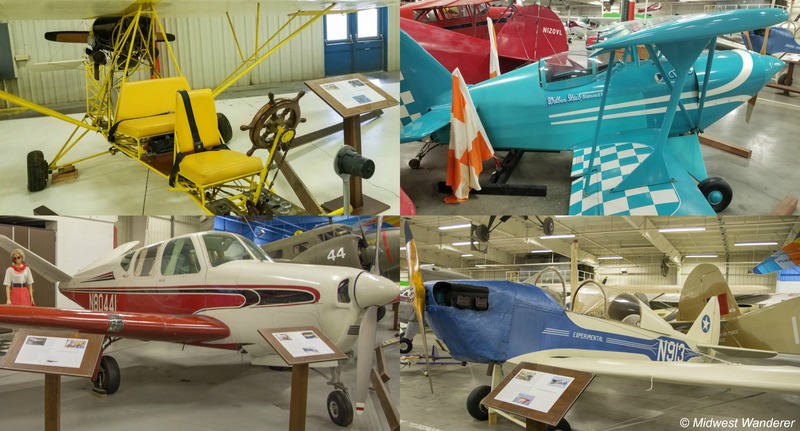 Today, there are over 100 aircraft in the museum, and as of 1997, the City of Liberal operates the museum. We were impressed by the aircraft variety, everything from large military aircraft, down to small home-built experimental aircraft. North American B-25 Mitchell, which was used in World War II. North American F-86 Sabre, a jet that you’ll often see in movies or photos of Korean War action. Bell H-13 Sioux, the type of helicopter shown in the opening scene of the M.A.S.H. television show. Bell UH-1 Iroquois, better known as the Huey, and the Bel AH-1T Cobra, both Vietnam-era helicopters. McDonnell F-4D Phantom, used during the Vietnam War. The Navy first used it as a fleet defense interceptor. Later, the Air Force and Marine Corps used it, as well. The HAL Gnat, a light fighter used by India’s air force from the ’70s through the early ’90s, is amazingly small. You can see in the photo below just how small it is, especially in comparison to the other fighter aircraft. We got a kick out of the stories on the museum placards that describe the experimental aircraft. 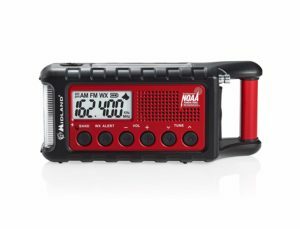 We’re sharing just a few of the stories here. One area of the museum includes really small aircraft, some so small we wondered how a pilot could even fit in them. In fact, there is one named “Tiny,” but apparently it wasn’t named after its size but rather, after the plane designer’s wife. The designer who built that plane, Wilbur Staib, competed against other designers to create the world’s smallest airplane. One of his rivals for the title was Ray Stits. Neither of them made the smallest plane. However, the title for the smallest monoplane did go to Ray Stits’ son, and the smallest biplane title was designed by Robert Starr, Stits’ former partner. The Bowers Fly Baby was first flown in 1962. It was designed by Peter Bowers, who was a former army engineer and Boeing employee. Bowers built the Fly Baby for the EAA’s (Experimental Aircraft Association) first design contest. The contest was supposed to be held in 1960. Bowers finished the plane in time, but there were only two planes ready to compete, so the contest was delayed two years. With two years to go, Bowers went back to work on the plane to perfect it. Then, just six months before the contest, the plane crashed in the mountains. Bowers and some friends were able to repair the plane and also add a few things. They won the contest. Three pilots wanted to build an open structure plane, with no cockpit and no cover. They named the plane the RLU-1 Breezy. It seems they used odds and ends in parts of the plane, including a ship wheel for the control wheel and seatbelts taken out of a car. When the RLU-1 Breezy was named the most popular home-built design at the 1965 EAA fly-in, people started requesting plans for the plane. The problem was, they had no plans. So the three designers had to reverse-engineer the plane to make the plans available. They ended up selling over 1,000 of the plans. 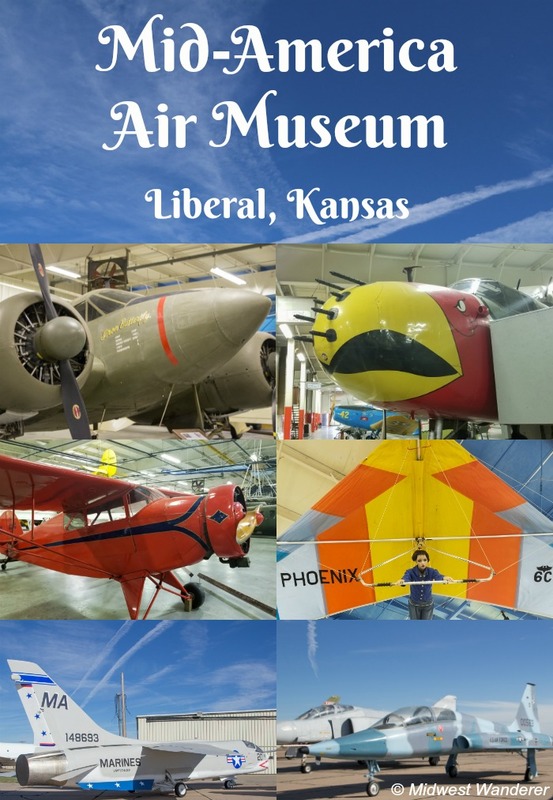 The Mid-America Air Museum is located at 2000 W 2nd Street in Liberal, Kansas. Check the museum website for hours, admission rates, and other details. The Bell AH-1T Cobra is available for photo ops. Left: HAL Gnat, light fighter used by India’s air force. Right: Republic F-105G Thunderbird. The size difference between these two planes is amazing.